MYRTLE BEACH,S.C. (JULY 19, 2014) - Early Friday morning, the front office staff of the Myrtle Beach Pelicans challenged their Vice President and General Manager Andy Milovich to receive an in-game prostate exam while singing "Take Me Out to the Ballgame" during the team's Prostate Cancer Awareness Night on Thursday, July 24. Milovich accepted the challenge but only if the Fierce Fallon Facebook Page reached 10,000 'Likes' by Thursday at 12:00 PM EST. The Fierce Fallon Facebook Page belongs to Carolina Forest 10-year old Fallon Emery who is battling brain cancer. In December 2013, Fallon was diagnosed with brain cancer. Fierce Fallon's Facebook Page has showcased Fallon's courageous battle and incredible spirit. The community has rallied around Fallon and her Facebook Page to show both personal and financial support for Fallon and her family. "Cancer has touched the Pelicans family in multiple ways over the last 12 months and we're happy that we can play a small part in drawing awareness and raising funds to assist in this fight," said Milovich. "If 'taking one for the team' keeps one child from growing up fatherless, then it will be worth it." The team's Strike Out Cancer efforts at Thursday's game will feature a Prostate Exam Reminder Giveaway (a.k.a. a foam finger with a blue reminder ribbon) to the first 1,000 men 18 and older. Ed Randall's Bat for a Cure will also be on hand auctioning off a team signed bat and providing potentially lifesaving information. A promotional video detailing the night and giveaway is available on the team's YouTube Channel. Prostate cancer is the second-leading cause of cancer-related deaths in the U.S.
With early detection prostate cancer is often treatable, leading to a 97% cure rate. July 24 is also a Thirsty Thursday, featuring $1.00 Bud and Bud Light Drafts from 6:00-8:00 PM, presented by Celebrations Nitelife, 96.1 WKZQ, The Weekly Surge, and WBTW News 13. There will also be postgame fireworks presented by East Coast Pyrotechnics. Prostate Cancer Awareness Night is the fourth night in the five-night Strike Out Cancer series, which concludes on Sunday, August 3 with Breast Cancer Awareness Night. During each game of the Strike Out Cancer series, the Pelicans players are wearing unique uniforms, which are currently being auctioned off. The auction closes on August 15, and fans can bid online. All proceeds from the auction benefit the American Cancer Society, the Mary Kay Foundation and the Bruce Dal Canton Fund. 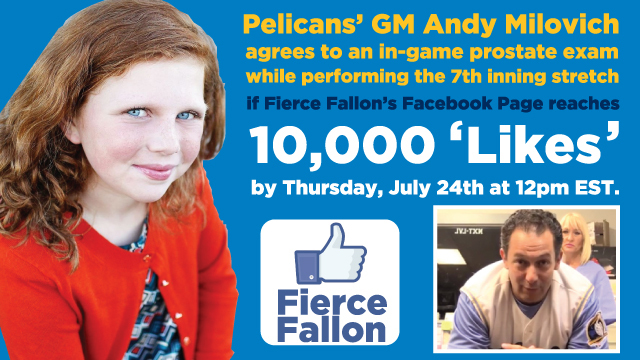 On Saturday, August 2 the Pelicans are hosting Coaches vs. Cancer and a silent auction to benefit Fierce Fallon. The auction will feature autographed items from various college and professional coaches including Steve Spurrier Dabo Swinney, Will Muschamp (Florida Gators Football), Clint Hurdle (Pittsburgh Pirates) and many more. Those that wish to support can also donate at www.fiercefallon.com. For tickets for Prostate Cancer Awareness Night or any or Pelicans home game in 2014, please call (843) 918-6002, e-mail info@myrtlebeachpelicans.com, visit www.MyrtleBeachPelicans.com, or visit the Pelicans box office, which is open Monday through Friday from 10 a.m. to 5 p.m. and Saturday from 10 a.m. to 2 p.m.